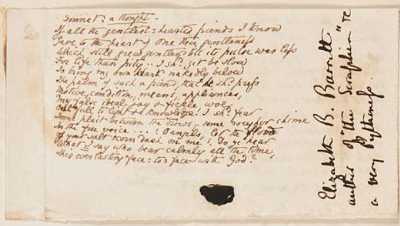 On Thursday July 5, 2012, auctioneer PBA Galleries will offer a rare original manuscript of a sonnet by Elizabeth Barrett Browning. It is estimated to sell for $5,000 - $8000. "Gave to the heart of one their gentleness..."
The third line begins "Which still grew gentler..."
The third line from bottom reads "Of your salt scorn dash on me!..." differing from the printed "Of bitter scorn dash on me!..." Written perpendicular to the text in a larger, later hand, in black ink in the right hand margin of the sonnet, she has inscribed "Elizabeth B. Browning / author of 'The Scraphian(?)" re / a very Pythiness." A small fragment of sealing wax lies beneath the sonnet. The fragment on the verso is also curious. "The Maiden's Death" (1839) was not published during Browning's lifetime (1806-1861) but was one of a number of early poems by her contained in a quarto manuscript volume sold at the Browning manuscripts sale in 1913. It was published in Cornhill Magazine that same year. The present fragment begins with the 19th line, "Weep for her who doth remove" and ends with the line "Dust to dust, she lies beneath." BROWNING, Elizabeth Barrett. "Sonnet - a thought" [i.e. "An Apprehension"]. 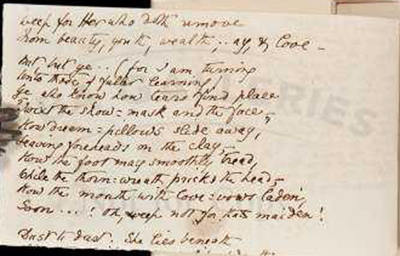 14 lines plus title, written in brown ink in a miniscule hand on a slip of paper; on the verso is a 13-line fragment from "The Maiden's Death," also in Browning's hand. Slip of paper is 5.8x11 cm. (2½x4½"), neatly glued along left edge to backing board so it can be lifted to view the verso. Matted along with a typed transcript of both recto and verso, framed under glass (removed from frame for examination). Images courtesy of PBA Galleries, with our thanks.